Dr. Neeta Verma has been associated with the introduction of World Wide Web services in Government way back in 1996. She has consulted a large number of Government departments on their Portal Development strategies. She has also developed ‘e-Government Toolkit for developing Nations’ on the behest of UNESCO in the year 2005. As National Project Coordinator she has led the Architecture, Design & Development of National Portal of India, india.gov.in a gateway to Indian Government Information & Services in Cyber Space. She had set up the first ‘Internet Data Centre’ at NIC in 2002 and looked after over all operations of the Government Data Centre set up by NIC across the country. Under her leadership, NIC has launched first National Cloud for Government spanning across its National Data Centre to provide state-of-art, agile, on demand ICT Infrastructure to government departments for delivery of Citizen Services. 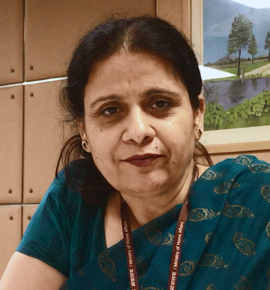 Apart from authoring the Guidelines for Indian Government Websites, she has written large number of technical papers published in National and International books and journals. She has been an invited speaker at many Scientific and Technical Seminars across the globe and received many significant awards to her credit.